"King o' the Faeries", "The Anvil" and "She Moved Through the Fayre" are approximations of traditional Irish tunes. "Sôspan Fach" is traditional Welsh. "Nature-Identical Mystic" is based on Bob Marley's "Natural Mystic". Matthew made up "Ayurvedic Toothpaste" and "Cartoon Welsh Girl", Inge made up "Breakfast in Kildare", we made up "Ambulance" and "The Unfinished Rockery" together and the rest are just jams. 1 was recorded by Dave Goodman at his studio in Whiteley Road, Crystal Palace, summer 1996 and later mixed by Matt Spacegoat. We were hanging about waiting for the Spacegoats to assemble for a recording session, so Dave suggested we lay something down. This was the only time we ever multitracked anything (the saz and mandolin were recorded simultaneously, though). 2 and 8 were recorded by Funkey at his studio in Sint-Niklaas, spring 1996, during a lunar eclipse. 3, 5 and 7 were recorded in Lizzie's field, Llandecwyn, N. Wales, summer 1997. Zymbii had lost a shoe on the way there, so we were stuck for almost two weeks waiting for a farrier. We ended up putting on a little gig for Lizzie and her friends, through the tiny little P.A. we were carrying around with us. It was quite a surreal time, as we were sharing the field with a llama and a Jacob sheep. 4 was recorded at a studio in Temple Bar, Dublin, May 1997, after the Treewalk and was used as a "hidden" track on a benefit CD called Trees are Life. The tune itself came together during the walk - intially Matthew working out a saz part in a field near Limerick, the whole thing crystallising atop the magickal faery mountain on the Burren called Mullaghmore. 6, 9 and 11 were recorded at Maughanasilly, West Cork, autumn 2003. Alan was about to leave for Aotearoa/New Zealand, and there was a bit of a gathering for the preceding full moon. 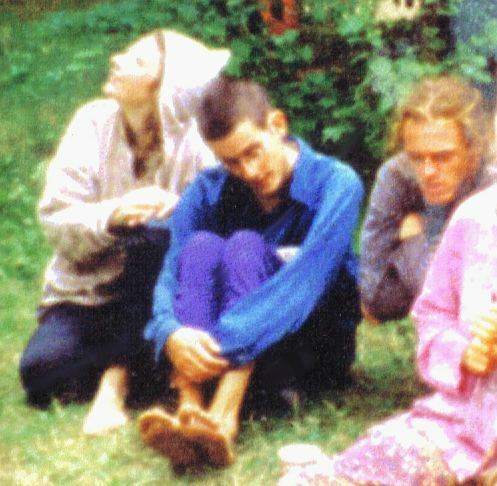 10 recorded at the Rigneys' farm, Cadamstown, Co. Offaly, May 1997, during a Rainbow Gathering which coincided with the end of the Treewalk. 12 and 14 recorded by Funkey at his studio in Sint-Niklaas, Samhain 1995. We'd just spent some time in the Pyrenees, and this session came together quite spontaneously on our return to Belgium. 13 was recorded on the Rinky-Dink stage, Big Green Gathering, Wiltshire, summer 1997. We were walking across Wales at the time, but took some time off to go to the festival. Alan was able to join us and add some percussion. 15 was recorded on Breney Common, near Lostwithiel, Cornwall, autumn 1999. We were travelling with the Dongas, camped nearby, en route from West Penwith to Keveral Farm (near Looe) where we spent the winter. I love these tunes and themes and in particular at the moment 'Breakfast in Kildare' because it evokes images of flowering meadows and gorgeous hedgerows. I'm sitting in rural France where a man with no soul has just, for the price of a couple of coins, attacked and decimated the hedge and tree opposite with a mechanical monster ill-fitted for the purpose. As our neighbour paid him for this butchery, I have no recourse but this soothing music. Thanks so much for making it available.